Doctor-recommended for the recuperating patient, Truform anti-embolism stockings are designed to help reduce the danger of thromboembolic disease. They are also ideal for use with the post-surgical, home convalescing patient. The closed toe offers a more natural stocking feel, ideal for early ambulation. Beige and black color options allow for a more attractive appearance while ambulatory. Truform stockings, socks and pantyhose feature Graduated Compression Technology, which delivers a compressive action to the leg that is greatest at the ankle, then gradually decreases toward the heart. The amount of compression is expressed as mmHg (millimeters of mercury). Graduated compression provides two primary benefits to the legs. Firstly, increased pressure on tissues beneath the skin helps reduce leakage of fluid from the capillaries and helps increase the return of fluid to the capillaries and lymph vessels, reducing and preventing swelling for the wearer. In addition, compression stockings help control the size (diameter) of the superficial veins that lie just beneath the skin, preventing the slowing of blood flow and blood “pooling” so it can flow more quickly up the leg back toward the heart. 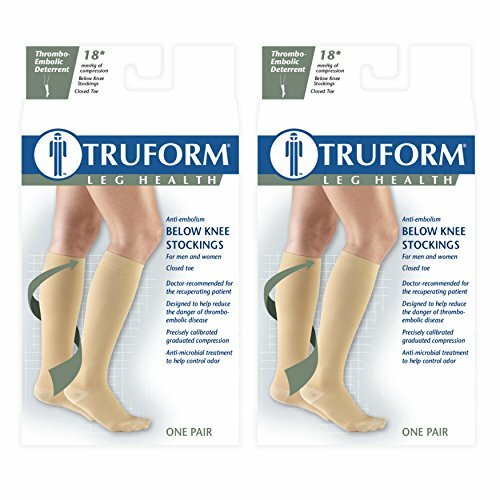 Truform graduated compression support hosiery works in concert with your body to help maintain good circulation and leg health. Truform combines the best materials, the latest methods of semi-automated manufacturing, and “old-worlde” hand craftsmanship to produce a high-quality product at affordable prices. Multiple quality assurance checks are performed throughout our entire manufacturing process to insure comfort, fit, durability, and an accurate, therapeutic, graduated compression profile. We take the extra time and effort necessary to insure a therapeutically effective, comfortable fit. The combination of state-of-the-art materials and equipment, plus knitting “know-how” sets Truform apart from the crowd to make your legs look and feel great! Measure your legs first thing in the morning when swelling is at a minimum. Measure ankle circumference at smallest point directly above ankle bone. Then, measure calf circumference at largest point (widest flare of calf muscle). Measure the length of you leg from heel at the floor to the bend in the knee. Use the size chart image as a reference.